This array of unique printable worksheets is specifically drafted to assist students in grades 2 to 5 master regrouping techniques in subtraction as they exclusively feature borrowing across zeros. 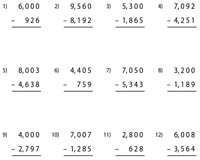 The worksheets are segregated into 2-,3-,4- and 5-digit subtraction to enable easy downloads. Become a member to get unlimited access to the worksheets and unlock various download options. 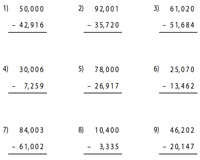 Get students to solve these 2-digit subtraction worksheets which feature zeros across every problem. Work them out to help them gain a better grasp on the concept of regrouping. Subtract 2-digit or 3-digit numbers from the numbers ranging from 100 to 999. 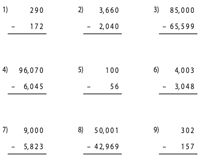 Get ample practice on borrowing across zeros with this set of worksheets. Boost a child's skill in regrouping with this compilation of 4-digit subtraction across zero worksheets. 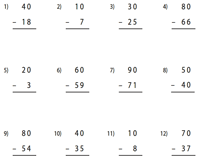 Each worksheet contains 20 subtraction problems arranged in the vertical format. Apply the regrouping concept in solving these multi-digit subtraction problems. This set could be more challenging as they may contain a succession of zeroes. Sharpen your regrouping skills with this assortment of worksheets that comprise zeros across 3-,4-, and 5-digit numbers. Click on the 'Download the set' option for all worksheets in this section. This eclectic mix of large number worksheets contains zeros across 5-, 6-, and 7-digit numbers presented in the column format. Solve these problems and watch your children excel at subtraction! Use the answer keys to check your responses. 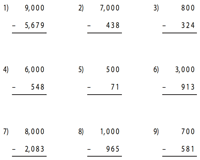 This set of worksheets features minuends with multiples of powers of 10. 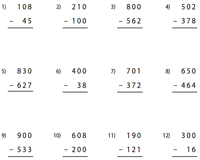 Level 1 worksheets contain minuends with multiples of 100 and 1000. 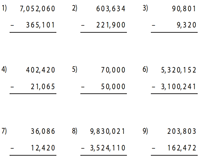 Level 2 worksheets comprise minuends in multiples of 100, 1000, and 10,000.